If ever a picture could capture the essence of a boy, this could be the one! This boy is fully absorbed with the making of his shot. He's not multitasking: he's so completely engaged in this moment, nothing else could possibly exist. He is playing as hard as he can play, living as intentionally as anyone can live. Could he hear the rush of his own blood and the squeak of his shoes on the court? Did he notice the rough bumps on the ball that in the past have rubbed his skin raw? Were the cheers leaking into his consciousness? Did he feel his sweat dripping? The flop of his hair? This boy LOVES what he's doing and doesn't need anything or anyone to complete him. And yet no one is excluded; his joy draws onlookers into the moment with him. Jakob's traveling team was playing a weekend tournament in Brainerd. 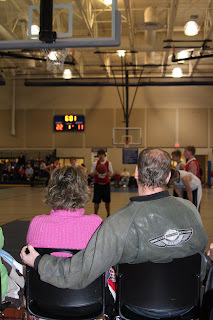 Grandpa Gordy took a break from radiation recovery and made the journey to watch Jake play. His galpal, Cindy, brought her digital camera and shot dozens of photos with her own boundless energy. She might have been as much fun to watch as Jake! 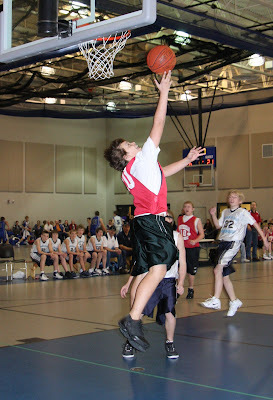 Cindy snapped this photo during a breakaway reverse layup (impressive basketball-speak if I do say so myself!) in the second game on Sunday. For Jakob's 14th birthday, Grandpa and Cindy enlarged this photo to poster proportions and framed it. It hangs in his freshly painted bedroom. The poster demands attention; while gazing at the image, I am filled awe and wonder that God chose me to mother this boy. Jakob played all day with brilliant energy and focus. We couldn't take our eyes off him! I pray my boys fail -- spectacularly -- to follow the current trend of constant multitasking. I hope they invest themselves fully in Now. They carry their history in who they are -- they don't need to wallow in it. Nor should they waste time constantly wishing away their futures. Imagine if we all quit multitasking. Imagine if we all quit agonizing over the past. Imagine if we all stopped wishing for tomorrow. Imagine. I hopped over from John's blog b/c I loved what you wrote in your comment...very convicting. This was such a GREAT read. I have one son and one daughter and I love how you wrote about your son. Look forward to coming back over here! It IS a special relationship -- truly unlike any other. Thank you for your gracious comments!